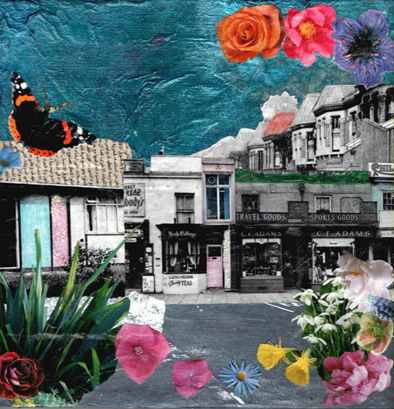 Amelia Critchlow is an artist, writer and educational practitioner. 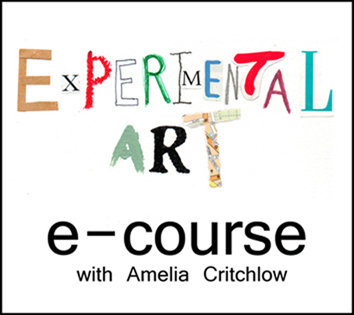 Last year she launched her first e-course, Experimental Art, and due to its popularity, she has created more opportunities to help you express your inner artist. I recently asked Amelia to share with us what it means to live a free spirited life-style. 1) How did you come to a place in your life where you embrace yourself as a creative person? I would say I’ve always been a creative person and encouraged to be so from childhood. As an adult, I often found art and creativity slipping as it’s not deemed practical or job-worthy, however, I made a decision to take that part of me seriously in my late twenties by going back to art school and doing a degree (10 years ago now) and it really has been the best decision I made. I have definitely made it work as part of my earning life and of course it’s my passion too! 2) What’s your favorite art medium for self-expression? I find it hard to choose one particular medium. But my favorites are: collage, hand-stitching, and wild experiments with paint, and ink. Currently I am exploring photography, but mainly where I can set up a scene though assembling, and also acquiring props – creating an imaginative reality and grown-up play really intrigues me! See my latest post here on play. 3) Where do you get your inspiration? I get my inspiration from artists: the amazing, wonderful, abundant resources of active artists who have chosen to embrace and honor their passion by doing art and being artists. I go to exhibitions regularly and am an art book junkie! Plus, of course, there is now a haven of art and creativity just by looking on the World Wide Web. 4) How do you manage to find time and make space for your creative projects? I have to treat my art and creativity as a professional and honored part of my life, otherwise it gets very easily side-lined. It is not a hobby, it is an intrinsic part of my well-being, life and profession. As dramatic as that may sound I have chosen to make it that way in defense of people telling me it was neither viable, sensible, money-earning etc. I chose not to listen to them and instead listened to my own intuition calling. I set aside ‘making’ or ‘art’ days and they are as valid as house-cleaning, any other paid work, or parenting. 5) What is a free spirit to you? I feel like a crazy free spirit and it feels good! My definition is a person who does not conform to the norm without questioning themselves, life, and what it may be about. A person who chooses to live life by their own rules and discovers and explores what works for them and honoring that without compromising others. Thank you, Amelia, for sharing YOU with us. I’ve been a participant in Amelia’s e-course and it’s awesome! Visit her blog to learn more. Your Personal Reflection: What inspires you? Share here by leaving a comment. Everyone who leaves a comment will be entered for a random drawing to win a spot in the January session of Experimental Art E-course. And if you want a double shot at winning, join my Facebook fan page today and you’ll be entered twice! I’ll announce the winner on Monday. Good luck!